The beautiful Golden Shepherd is what happens when you cross two of the most popular dogs in the world. 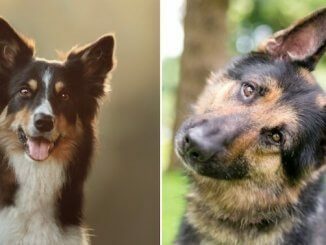 The intelligent and working German Shepherd is mated with the loyal and loving Golden Retriever to make a loveable mix. Thriving in busy and active homes, we have put together 14 incredible facts to get to know this smart and playful mix a little better. As this breed is a hybrid dog, it is not recognized by any major Kennel Club. However, they have been registered by the International Designer Canine Registry since 2009. They are also registered with the Designer Breed Registry. The German Shepherd can be either the dam or sire for a Golden Shepherd puppy. Despite its popularity, the German Shepherd certainly had a controversial past. Thanks to the hollywood movie Strongheart, the German Shepherd soared in popularity in the early 1900s. After its initial popularity, along came the War! Due to the German association, the Shepherd was shunned which led to the change in name to “Alsatian”. It seemed to work and allowed for a steady interest in this hardy and intelligent breed. Used frequently in military and police work, the German Shepherd is a fearless comrade. The Golden Retriever, originating in Scotland was a result of cross-breeding a yellow retriever with a tweed water spaniel. It is also believed that Irish Setter and Bloodhound were in the mix at some point. The Retriever was loved for its gundog capabilities and soon became popular in the US in the early 1900s. The Retriever ended up Presidential, with Ford having his very own Golden named Liberty. 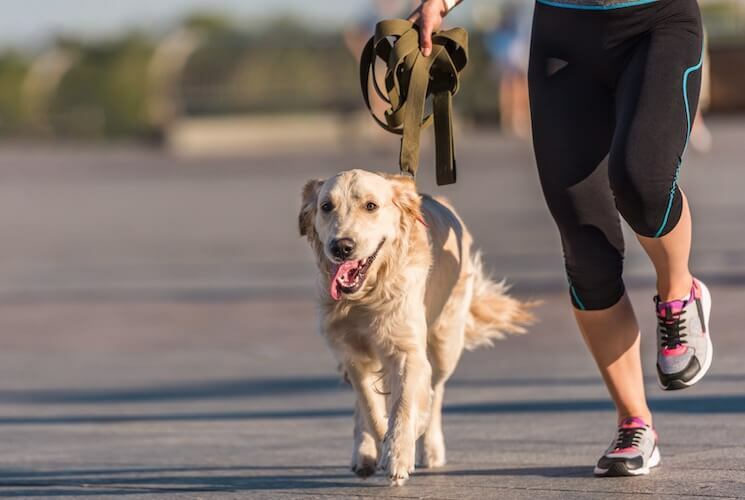 Suited to very active homes, the Golden Shepherd is happiest with upwards of 60 minutes exercise per day. Look no further if you want a new hiking or running buddy! With both parents being historic workers, this mix loves being busy. If it’s not physical exercise they thrive with mental stimulation. Brain games are a must! Their high intelligence means they pick up tricks super-fast and will love playing treasure hunts or hide and seek with the kids. 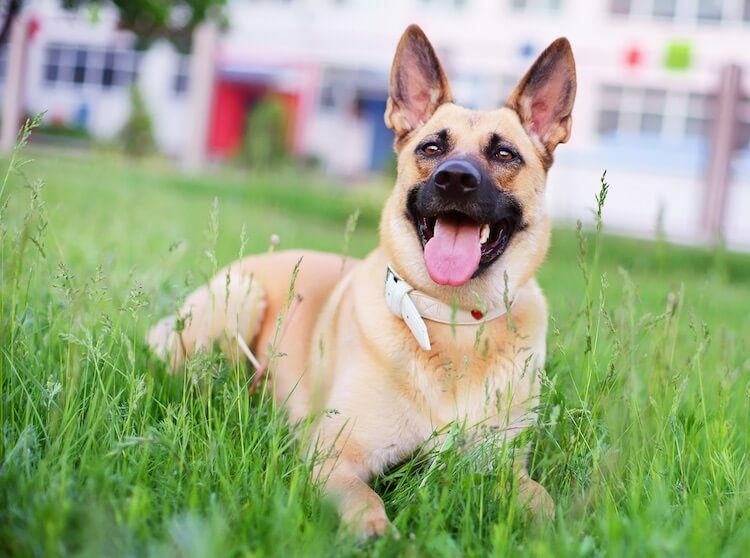 Your mixed breed dog may be more German Shepherd than Golden, or vice versa, when it comes to their temperament. 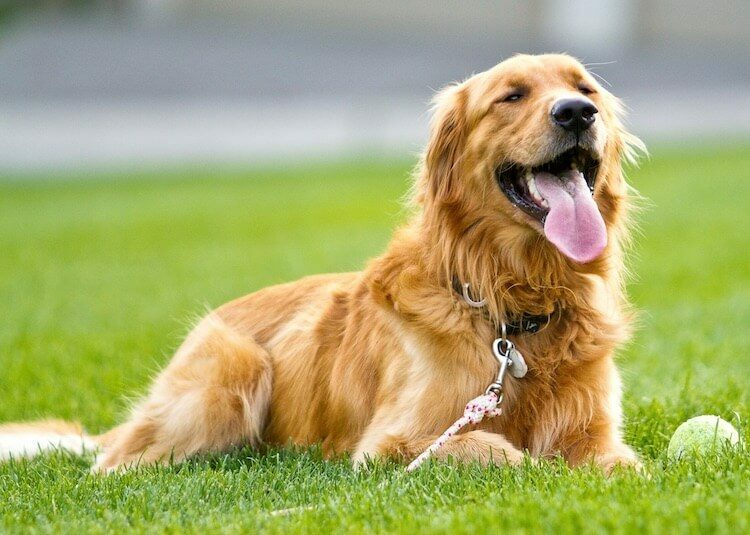 Generally, the Golden Shepherd is affectionate, playful, smart and sociable. Yet, it is possible that they could inherit the more protective nature from their Shepherd parent – so they might be a perfect watchdog. Early socialization is essential in warding off particularly wary behavior from an overly protective dog. They are known for being very tolerant of other pets in the home. 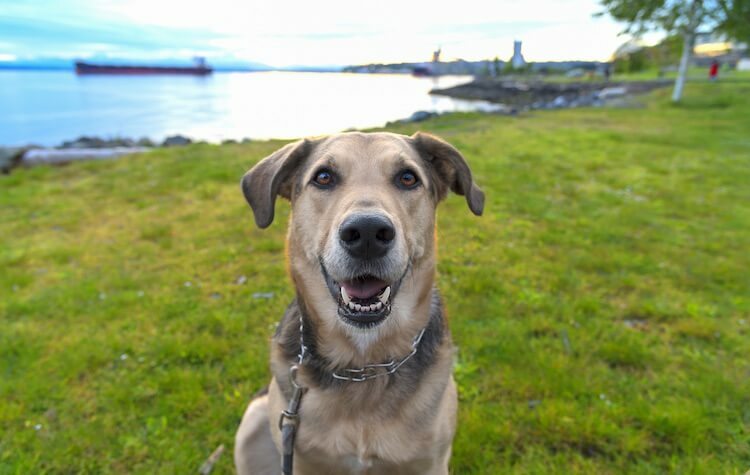 Due to the friendliness of this mixed dog, when socialized correctly, and raised with other small pets and dogs, the Golden Shepherd loves having friends at home. Don’t completely ignore their parent’s working history though; they may still chase squirrels and birds out on walks. Use positive reinforcement and distraction to tackle this. You want your puppy to learn that you, as an owner, are more interesting than anything they will come across. Being super-athletic and trainable, this dog thrives in sports like chase, agility and flyball. Agility is where handler and dog navigate a course with obstacles like ramps, tunnels and jumps. The handler isn’t allowed to touch the course or the dog, so performance is limited to command and movement. Flyball is where dogs race against each other, over hurdles, to get to a tennis ball and return to their owner. It’s particularly suited to those toy-orientated dogs for that reason. High energy dogs love being busy and having a purpose; if you’re considering taking up a new hobby, the Golden Shepherd can show his paw to many. On the whole, the Golden Shepherd is a people-pleaser who learns new tricks incredibly quickly. They often inherit this intelligence from their German Shepherd parent and their innate eagerness to please from their Golden Retriever parent. They respond best to positive reinforcement and reward-based training. Dogs learn through the consequences of their behavior. If their behavior causes a positive consequence, they are more likely to repeat that particular behavior. 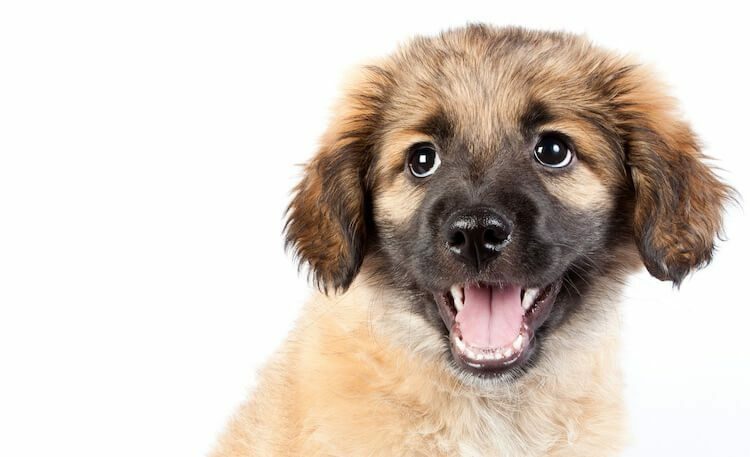 If you want your Golden Shepherd puppy to sit at the edge of the sidewalk before crossing the road and reward them with a healthy snack or praise each time they do so, they will soon learn to sit before you ask them, in anticipation of the reward. Like their Golden Retriever cousin, the Golden Shepherd is generally suited to most families, providing they have experience of large breeds. 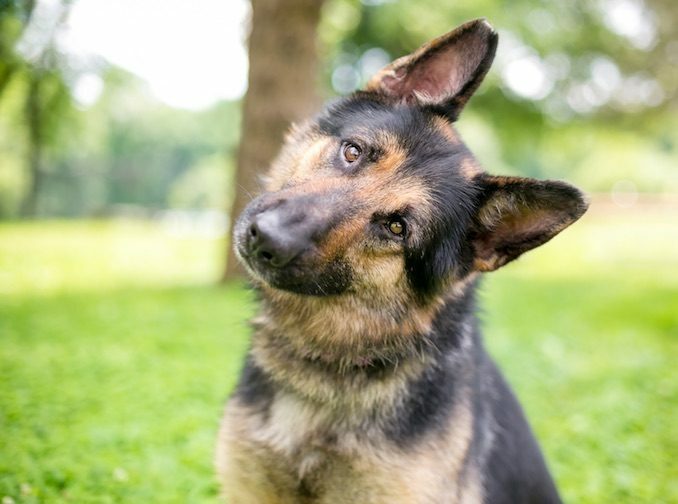 The intelligence of the German Shepherd dog means they are a dream to train – every member of the family can, and should, be involved in their socialization and training. The eagerness to please of the Retriever means they really do want to get it right. They love playing in the yard with older children and they are equally a super sofa buddy when the kids just want to relax at the end of the day. A Golden Shepherd puppy will cost in the region of $500 – 800 USD, depending on the breeder you find. 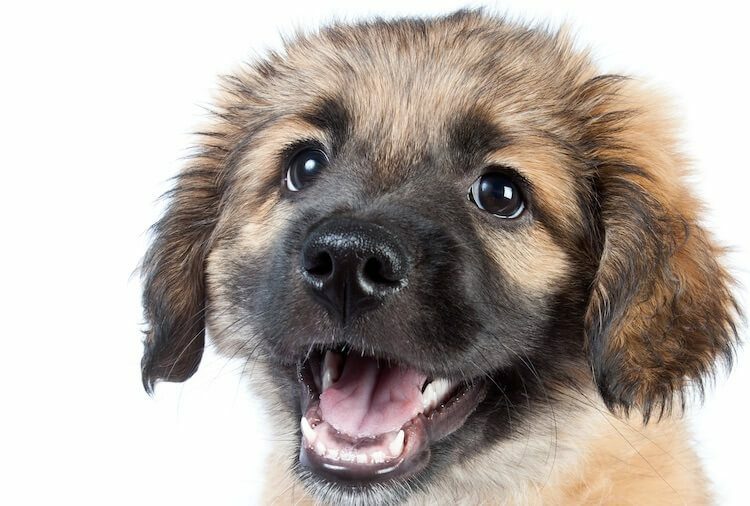 If your puppy is a first-generation mix, their appearance and temperament will be a little harder to predict. 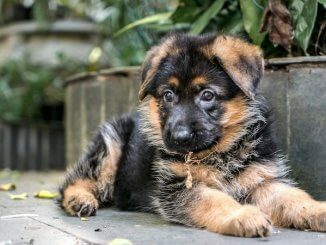 As German Shepherd puppies often have floppy ears, when they are born, eventually becoming erect as they grow, the chances are your puppy will too. Because of this, their appearance can range dramatically. 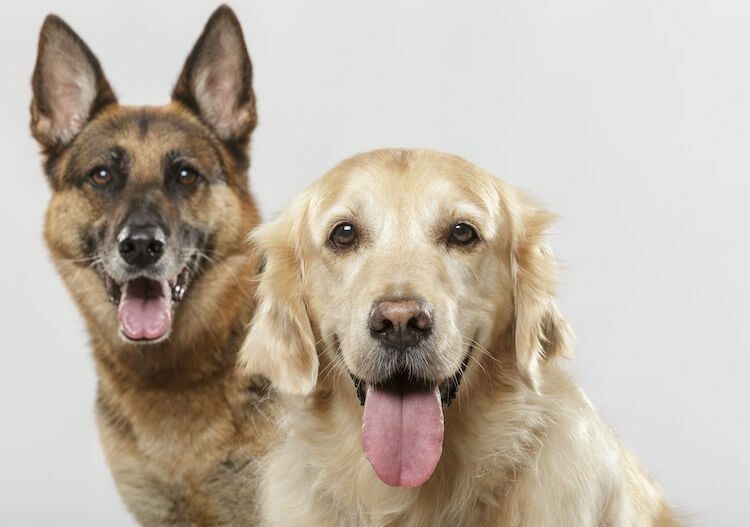 Some are seen in black and tan coloring; just like their German Shepherd parent and some are seen in golden color tones – just like their Golden Retriever parent. Remember the range of coloration of the German Shepherd dog though. They also come in black and white colors with both long and short coats. The appearance of second and subsequent generations of Golden Shepherds is easier to predict, but if you have a first generation, you really can’t be sure of what you’ll end up with. Being a large breed, this dog is at risk of bloat/gastric torsion. This is where the stomach twists and fills with gas and in some cases, it is fatal. It is suggested that small, regular meals can help to reduce this risk. They are also at risk of elbow and hip dysplasia. This is when there is abnormal development in the joint, resulting in lameness, pain and stiffness. Reputable Golden Shepherd breeders should always screen their breeding stock and not breed from dogs who have poor hip and elbow scores. This pooch is also at risk of Degenerative Myelopathy which is prevalent in both parent breeds which results in hind leg paralysis. Whoever is on vacuum duty won’t be too impressed. Like its parents, the Golden Shepherd will have a double coat; a coarse outer guard layer and a downy undercoat to keep them warm. They will have two major blow outs per year, but, realistically your home will always be full of dog hair. You may want to rethink having any black clothing in your closet. Regular grooming is a must; they will need brushing two to three times per week and whilst you’re at it, keep an eye on their ears and teeth. Weekly brushing will keep their teeth sparkling and healthy. Their love of people can sometimes get them in hot water. Golden Shepherds don’t tolerate being left alone for long periods. Being a super-loyal companion, they don’t understand why you would want to leave them. They can become anxious and destructive; they may bark and howl. Keep time alone to a minimum and bring in a dog walker or consider doggy day care if you do need to leave him for long periods of time. They suit most families with experience of large breeds. They are affectionate, loyal and sociable dogs which are super trainable and eager to please. Every member of the family can get involved in their training and socialization; from basic commands to learning party tricks. They tolerate kids of all ages, when the kids understand their needs and nuances. They are also pretty easy going when it comes to sharing their home with other dogs too. 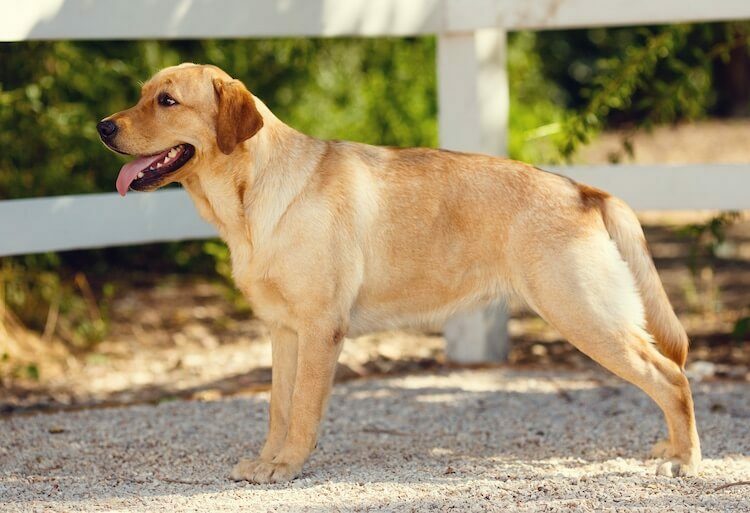 With solid breeding, correct socialization and continued training, this pooch really is the perfect addition to any family who can provide the time and exercise he needs. Let us know if you are thinking of adding one of these smart and playful companions to your family. Miniature German Shepherd: Do These Pocket Sized Dogs Exist? Shiloh Shepherd: A Better Version of A German Shepherd? Care to recommend some Golden Shepherd breeders? Thank you – great to hear from you. In terms of Golden Shepherd breeders, try our responsible breeder’s guide.